On the Strip at Las Vegas Blvd South and East Flamingo Road. 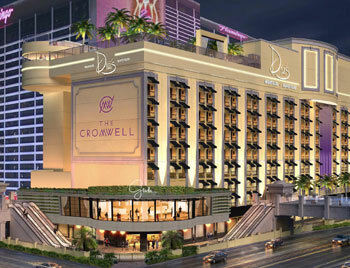 The Cromwell's glamorous 40,000-square-foot casino offers the latest slot machine games, as well as popular classics. Take a spin - this just might be your lucky night. The Cromwell's 40,000-square-foot casino offers 66 popular Las Vegas table games. Those seeking a more private gaming experience can play in the high-limit area or the casino's reserved gaming space, The Abbey. Raise the stakes and take a chance at The Cromwell's high-limit area, featuring three popular Las Vegas table games. The Abbey An Intimate Gaming Experience. Located just off the casino floor this elegant room features a curtain that can be drawn for increased privacy. This charming Las Vegas restaurant welcomes diners with warm colors, comfortable furniture and natural lighting thanks to the restaurant's huge retractable windows. Guests can eat in the dining room, lounge or on the outdoor patio, boasting breathtaking views of the Bellagio fountains and Caesars Palace. The luxurious 65,000-square-foot Drai's Beach Club * Nightclub hosts the hottest DJs and offers both an indoor and outdoor rooftop party experience.